Installing in a room where you can access above the ceiling. First use a pipe and wire detector to scan the area where you want your speaker. Once you are happy there is no wires or pipes above push a bradle through the ceiling. If you can access above, take a look to ensure that you have enough space for the speaker and you can run the wires. 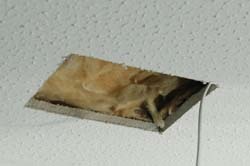 Make sure there are no wires or pipes nearby or your not going to try and cut a joist. Use a template to mark the cut out and make sure it lines up with the walls and is symmetrical in the room. Use a sharp craft knife or a short saw to cut out the hole for the speaker. 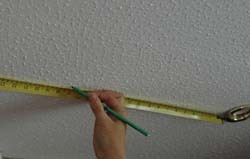 Installing a ceiling speaker in a room where there are floorboards above. Similar process as above but you need to try and minimise the joists you need to cut through to run the cables and also try not to take up too many floorboards. Sometime this will mean compromising where you put the speakers. 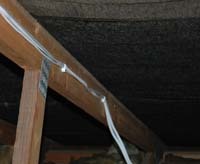 For example its worth following the line of joists for the speakers so that you can run the cables together. We have found that chimney or drain rods are an excellent device to help push cables under floorboards. When choosing the location of the amplifiers for the multi room system you need to consider which system you use. The Sonos system we used it doesn't matter too much where they are as you don’t really need to access the boxes too much. The only thing to consider is the range for the wireless remotes. Other systems require more thought. We located most of our Sonos Zone players in the loft out of site and where its easy to get cables to them. You should also look to maximise the use of soil pipe boxing in and cupboards to run the cables for a neat job. Use good quality cable for the speakers and consider any other cabling you need to go in the same place e.g. TV, Cat5 network cable, telephone cable, SVideo and even security alarm cables. Once the cabling is in place solder of fix the cables to the speakers and secure them using the screws provided. Always fix the speaker end first incase of short circuits as this can damage hifi equipment or amplifiers. Make sure that the speaker cabling is secured using the correct sized cable clips, this will help ensure that wires do not get broken or people tripping over them. Its also worth, where possible to run speaker cables away from mains cables as sometimes interference can occur which will result in a irritating buzzing or humming noise from your speakers. This site is owned and operated by 4theUK Ltd. All contents are protected by copyright.